A couple years ago I made my original recipe Red Velvet Strawberry Shortcake Cake. 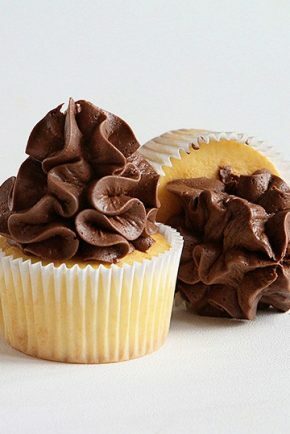 These cupcakes are the babies to that original cake. With a special twist of course! I can’t think of any better time to enjoy a strawberry shortcake than the long, golden and warm days of summer. So adding this cupcake to my summertime baking was a really natural progression! 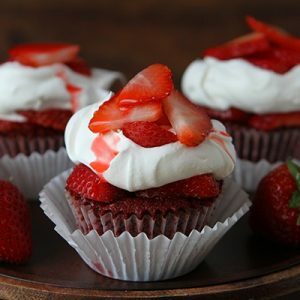 I love the light whipped cream and the fresh tart strawberry in combination with the dreamy red velvet cake. The reason this version of the classic Strawberry Shortcake is the best is that of the awesome Red Velvet Cupcake recipe. 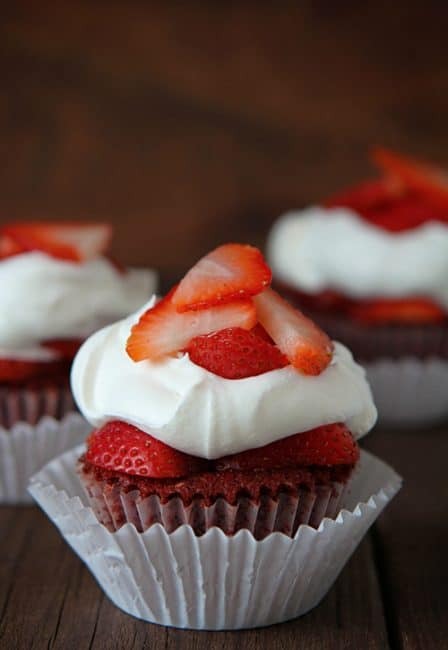 Perfectly decadent and rich, when paired with the strawberries and whipped cream, these cupcakes are WINNING! However… I made one very tiny teensy weensy addition. Grenadine! I drizzled a bit (maybe 1/2 teaspoon) over the top and let it soak into those glorious strawberries. Then, realizing just how amazing that tasted, I got the idea to drizzle some more on the cupcake prior to assembling them. Do it. Just do it. Drizzle grenadine. (optional. Nevermind, not optional! 😂) Cut up strawberry into flat slices. Place on the cupcake. Drop a dollop of whipped cream on top. 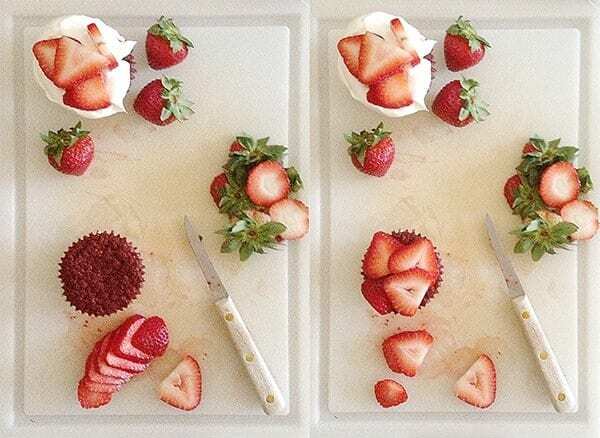 Cover with more strawberries. *It’s not good for you. 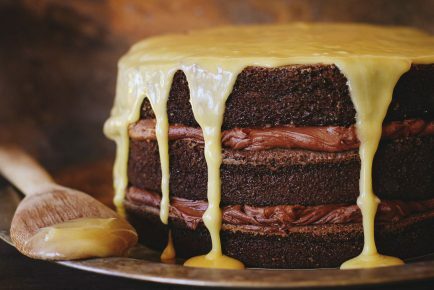 Don’t listen to me, I write a blog about sugar and cake. That extra layer of strawberries under the whipped cream makes such a difference. 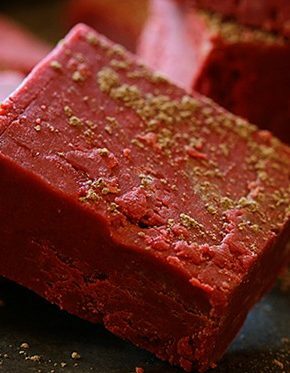 Then when you bite into the red velvet… it’s so unexpected! But amazing. Heat oven to 350 degrees F. Line a 12-cup muffin pan with paper liners. In a medium bowl, whisk flour, sugar, cocoa powder, baking soda, and salt together. To the large bowl of a stand mixer add buttermilk, oil, eggs, food coloring, vinegar, and vanilla and beat until well blended, about 2 minutes. With mixer on low speed, slowly beat in flour mixture until blended. Fill muffin cups two-thirds full. 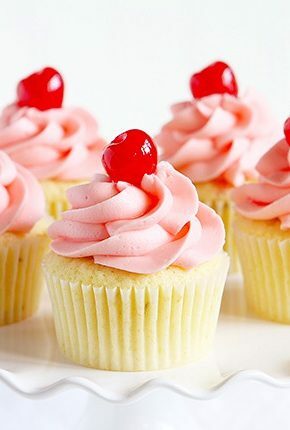 Bake 18-20 minutes or until a toothpick inserted in center of cupcake comes out clean. Let cool in pan on a wire rack 10 minutes; remove from pan and cool completely on rack. Recipe adapted from Redbook Magazine. Don’t miss my PERFECT Red Velvet Cake! Like these cupcakes? 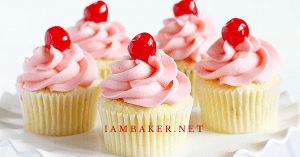 Check out the other unique and delicious recipes shared exclusively on iambaker! These look incredibly delicious!! I like the addition of grenadine. I have enough of it laying around my house as we stopped adding it to our drinks recently. This will be the perfect way to use it! these are beautiful & look so wonderful!! perfect! Brilliant idea – these look fab! I just love red velvet! These are summer in a little wrapper! 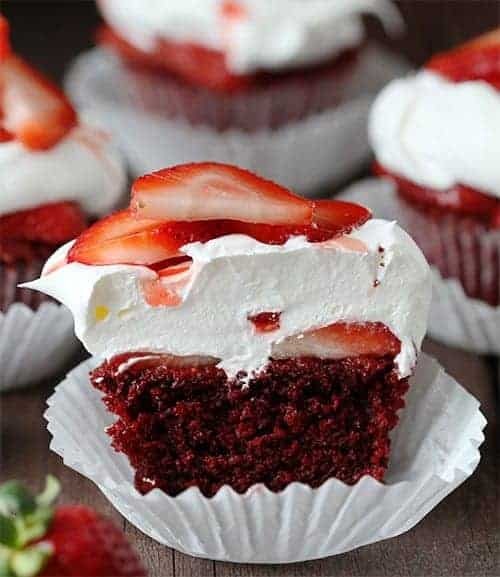 Such a great idea to combine fresh strawberries and red velvet! These were so moist and heavenly!!! I added more cocoa powder in mine to make them taste more chocolatey and they turned out amazing! I’ve tried it drenched with passion fruit and it’s yummy too. Gonna try grenadine next! These are just lovely – and so sweet and summery! Fun! What a pretty color too! These look insanely delicious. I think you need to make me one. Or twelve. Oh my gosh. 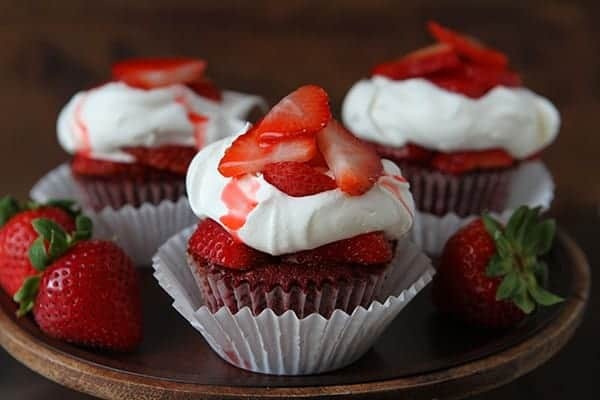 I am still obsessing over the red velvet strawberry shortcake you made a while back, and now cupcake form?! You are killing me!! YUM! These are so pretty! I love the red velvet twist! 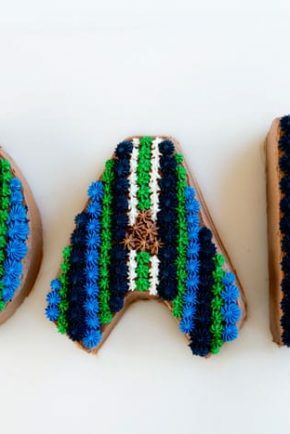 So creative and delicious! would regular red food coloring work instead of gel? I love this post!! You made me laugh out loud 😀 I will definitely follow you! I am glad someone is silly like me. Hi what brand of food color do you use? Awesome works and love your recipes! 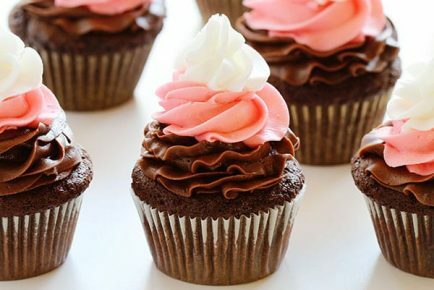 Everyone love it as the chocolate cupcakes everybody favourite.